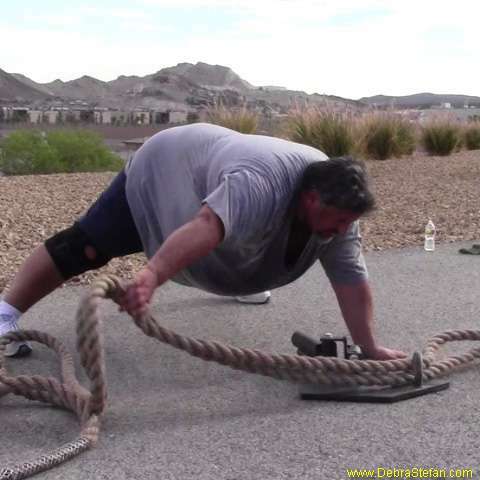 How does a 500LB man work out at a Morbid Obesity Camp? Weight loss boot camp progresses clients according to exercise readiness. What is “exercise readiness”? That means you are ready to do whatever you CAN do to achieve an increased activity level. So first weigh all risk factors over benefit of an exercise then choose activities wisely. The morbidly obese man in the image seen here has a knee problem. Therefore, postures where he does not have to bend his knee to a greater degree are preferable. Can he work out intensely? You bet he can. Simply factor in the heavy cargo he is porting around and merely walking from one room to another can bring on a sweat. The fact is that simple movements that avoid additional stress to inflamed trouble spots allow one to “work around” painful joints. There is always a way to get a good workout when you are willing to get creative.